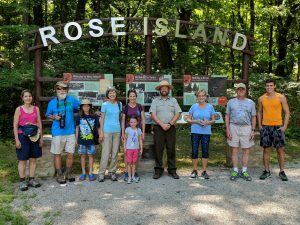 On June 30 I joined Falls of the Ohio Foundation members Dee Linn, David Dockstader and Stan Dunn along with their extended families to tour historic Rose Island at Charlestown State Park. Rose Island was a grand amusement park that flourished from 1923 until the record Ohio River flood of 1937. This Indiana State Parks’ restoration project features remnants and interpretations of many of the Rose Island amenities, including the foundation of an Olympic size swimming pool, a dining hall, a roller coaster and a zoo. The Rose Island tour was a Falls of the Ohio Foundation event for its valued members. Charlestown State Park interpretive naturalist Jeremy Beavin led the hike, and provided guests with a glimpse into the history of Rose Island.